The words “fall” (the fall of the leaf) and “autumn” became common words around the 16th century to name the season that comes after summer. Before that, people referred to the season as “harvest.” But with fewer people farming and more people moving into town, autumn and fall became the popular names for the season. Whether you call the season “fall” or “autumn,” the coolness and crispness of the air after hot summertime is refreshing. Here are some activities, books, and DVD’s to help in teaching children about this season. Have children collect pretty fall leaves (real ones). Make a huge tree trunk with limbs out of pieces of brown construction paper or poster board and secure to a bulletin board or to the wall. Attach the fall leaves onto the tree and around the base of the tree. Have children cut out shapes of leaves in different colors of construction paper (green, red, orange, yellow, and brown). Make a large tree trunk with limbs out of brown construction paper or poster board. 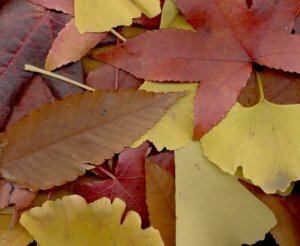 Use the leaves in various ways, as a reward for good behavior, for completing a goal or assignment, etc. Let the child write their name on the leaf and attach it to the tree each time they accomplish something. Have children collect acorns. Glue on eyes, mouth, hair, etc., to make acorn people. Leaf rub: Collect fall leaves and place on white sheet of paper with the vein side up. Place another sheet of white paper on top. Peel paper off crayons to be used. Rub the side of the crayon over the top sheet of paper to make a design. Pressed leaves in wax paper mosaic: Place fall leaves between two sheets of wax paper. Place heavy book on top of wax paper to flatten the leaves. Cut two pieces of brown paper out of a paper bag. Place wax paper on top of brown paper, then a layer of leaves, then wax paper, and last another sheet of brown paper. Have an adult iron on top of the brown paper with the iron set on the medium setting. Make sure the wax paper has stuck to the leaves. Cool. Trim edges of wax paper if necessary. Welcome Fall by Jill Ackerman. Good for ages 1-4. Tactile board book. Every Autumn Comes the Bear by Jim Arnosky. Good for ages 3-5. Watercolor paintings and simple text reveal the changing seasons. Apples and Pumpkins by Anne Rockwell. Good for ages 3-6. Story about pumpkin and apple picking. Blue’s Fall Day, Blue’s Clues Series by Lauryn Silverhardt. Good for ages 3-6. Blue picks apples and pumpkins. Little Red’s Autumn Adventure by Sarah Ferguson. Good for ages 3-6. Little Red and her friends’ adventure on their way to the Great Harvest Festival. Arthur Jumps Into Fall by Marc Brown. Good for ages 4-6. Arthur’s leaf raking job turns into a leaf party. When Autumn Falls by Kelli Nidey. Good for ages 4-6. Making caramel apples, bobbing for apples, Jack-o-lanterns, and leaves are part of autumn. Leaf Trouble by Jonathan Emmett. Good for ages 3-7. Little squirrels are scared when leaves start falling off their home and try to stick them back on until mama explains about autumn. I Know It’s Autumn by Eileen Spinelli. Good for ages 4-7. Delightful book about autumn with rhyming text. Fall by Nuria Roca. Good for ages 3-8. Beautiful illustrations. Leaf Man by Lois Ehlert. Good for ages 4-8. The travels of a man made of leaves. Little Yellow Leaf by Carin Berger. Good for ages 4-8. Yellow Leaf is not ready to fall off the tree and float away. Story is good for someone who is afraid to face the unknown. The Fall Festival by Mercer Mayer. Good for ages 4-8. A fun adventure of picking apples, going on a hayride, and picking out the perfect pumpkin. Apple Picking Time by Michele Benoit Slawson. Good for ages 5-8. Anna and the town pick apples during the fall apple harvest. Some American history is given. Autumn: An Alphabet Acrostic by Steven Schnur. Good for ages 5-8. A brief poem for each letter of the alphabet with rich descriptions. The Fairest of the Fall by Disney. Good for ages 5-8. Two stories about Ariel and Sleeping Beauty during the fall season. Let’s Explore Autumn and Winter, Levels 1-3. DVD approx. 30 min. Produced by One Smart Cookie. Distributed by Library Video Co.
Tractor Ted in Autumn Time, Children’s DVD. Good through age 6 or 7. Experience life on a real farm. Weather for Children: All About Climate and Seasons by Schlessinger Media. Good for grades K-4. This entry was posted in Fall/Autumn, Seasons and tagged kid's activities to teach about autumn, kids activities to teach about fall, teaching children about autumn, teaching children about fall by Teacher Tips. Bookmark the permalink.